Professor Huib de Vriend is a civil engineer by training. He received his PhD from Delft University of Technology. 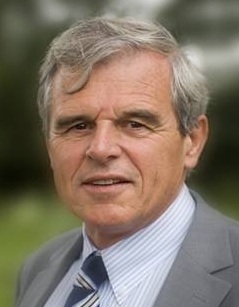 Before his retirement in 2012, he was director of science of Deltares and part-time professor of river engineering and eco-hydraulics at Delft University of Technology. He is director of the EcoShape Foundation, which coordinates the ‘Building with Nature’ innovation programme executed by a consortium of government agencies, universities, research organisations, consultants, and engineering contractors. Prof. de Vriend is a member of the National Commission for the EIA, and of the think-tank on flood safety of the Netherlands Ministry of Infrastructure and Environment. I am a civil engineer by training and I hold a PhD on river bends from TU Delft. After finishing my studies, I started working at the Coastal Department of Delft Hydraulics. In 1993, I became a professor at the University of Twente, and soon afterwards, I started a part-time professorship on River Engineering at TU Delft. In 2002, I was appointed Director of Science at Delft Hydraulics (later Deltares), combined with my part-time professorship. In 2008, I became Scientific Leader of a national programme called Building with Nature, which is implemented by EcoShape (www.ecoshape.nl), a consortium of private parties, government organisations, and research institutes. In May last year, I retired from my work at Deltares and the university, and I am currently dedicated to Ecoshape and Building with Nature. 2. Where do you think the emphasis should lie in the future for restoring European rivers? What key actions need to be prioritised? European rivers, as well as those in the rest of the world, are affected by damming. Dams influence the supply and flow of sediments and nutrients in a river system. They create distortions and break the natural balance, resulting in disastrous impacts not only on the river itself, but all across the system, including coastal zones. This is, in my opinion, one of the main issues concerning rivers in Europe. River restoration is about re-establishing the natural dynamics of the whole river system, and that requires a large-scale perspective. My perception is that many people who are involved in river restoration focus only on small-scale projects and forget to look into the effects of restoration on the whole system. While this is understandable given the complexities involved with adopting a more holistic approach (e.g., resource limitations), I do think we have the obligation to look into the aggregated effects of small-scale interventions. When combined, all these individual interventions represent a large-scale activity to which corresponds a large-scale response from the river. When we fail to consider downstream effects and long-term impacts, we are missing a big part of the picture. I think we should be much more concerned about this issue than we currently are. 3. In your opinion, is it possible to combine river restoration with other functions, in such a way that there is an economic driver for it? How can this be achieved? I think it is tactically clever to identify economic drivers to support restoration initiatives. River functions like water availability, flood defence, navigability, and nature protection are all economically relevant. For instance, you can use restored wetlands to store water (“sponge” effect) and maintain flow regimes even throughout the year, increasing water availability, and reducing vulnerability to extreme weather events. A problematic issue with natural water retention is that the costs and the benefits of measures fall on different hands. This calls for a governance setting in which investors actually profit from measures and those creating the costs actually pay for them. A good example of this is navigability, a function that is maintained by the government but whose economic benefits are gathered by its users. These economic and governance settings make it a real challenge to create economic drivers for river restoration. As to the role that the EU Water Framework Directive (WFD) can play in this context, I believe legislation leads to minimum response, that is, the minimum effort is made to stay within the law. I would like to see us going beyond that. I believe the WFD is a very good start because it triggers development, but I think it should be complemented with other drivers like public-private cooperation. 4. Can you tell us about the Dutch Room for Rivers Programme and its achievements so far? This project is a national initiative running until 2015 which is in line with the EU Floods Directive and consists of a large number of interventions directed towards flood protection in the Netherlands. These interventions started in 1995 as alternatives to accommodate a higher design discharge without resorting to dyke strengthening and dyke raising. The programme is based on the idea that when a river is confined, flood level and propagation speed are raised. In other words, the lead-time during which prevention and mitigation measures can be implemented is reduced, resulting in more severe floods and stronger impacts. The project follows a clear sequence that starts with understanding the functioning and dynamics of a river system and its responses to interventions, and only then designing those interventions and making considerations for floodplain maintenance. The positive effects of the programme can already be seen in the earlier implementations, e.g., on the River Meuse where some river dynamics are coming back, however most results are still limited given that the majority of the interventions are currently still being executed. Nonetheless, one important result has been the influence of the programme on the public acceptance of nature protection and river restoration. This is highly transcendent since our design floods have a probability of occurrence of 1 in 1250 years; such a rate combined with low public acceptance levels can cause restoration measures to fall back in the priority list. Towards the future, the rivers vision of the Delta Commission (a programme dealing with flood safety and freshwater supply in a climate- and societal change setting) will become the natural follow-up of the Room for Rivers Programme. 5. You have led research projects addressing river morphology and nature restoration from an engineering perspective. What are main lessons learned from such activities and how can such projects connect to the work being done by REFORM? A very important lesson we learned is that our projects had to operate in a continuum between nature, engineering and society. The complexity of implementing an initiative and the number of stakeholders involved in the process require that governance, decision-making and public support issues are attended. In the case of research projects like REFORM, this would call for the involvement of social scientists for example. Furthermore, one must pay attention to the great array of barriers that can hinder the implementation of innovative solutions. Contracting, financing, rules, and regulations can all turn into stumbling stones which can keep a project from reaching its full potential. Project leaders have to think through the whole chain of actions and events that ultimately lead to an implemented project, and this is much more than just a good idea or good research. Identifying and using opportunities like aligning economic and nature restoration objectives or having a “political champion” in the team can be very beneficial in overcoming barriers and complexities. I consider REFORM a great opportunity to bring nature restoration further and activate the general interest to include nature components in engineering works. Huib J. de Vriend was interviewed on 21 May 2013 by Eleftheria Kampa (Leader of Dissemination and Stakeholder Involvement of REFORM, Ecologic Institute) and Gerardo Anzaldua (Researcher, Ecologic Institute).